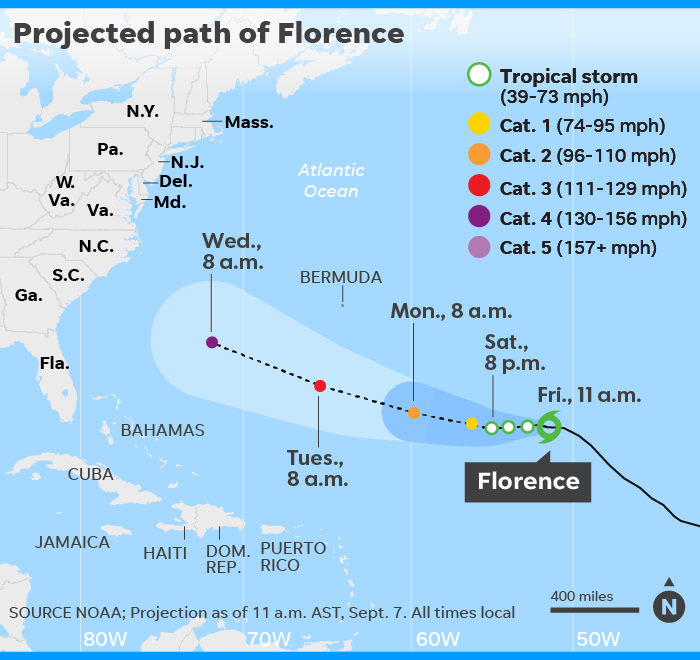 Hurricane Florence weakened to a tropical storm overnight but continues to creep closer to the United States is expected to regain strength as it nears the East Coast. As of 5 p.m. ET Friday, Florence had winds of 65 mph and was moving to the west at 8 mph. The storm’s center was 905 miles east-southeast of Bermuda. After it weakens and regains strength, it’s forecast to become a Category 4 hurricane with 130-mph winds as it nears the United States. “Regardless of Florence’s eventual track, large swells will begin to affect Bermuda later today and portions of the U.S. East Coast this weekend, resulting in life-threatening surf and rip currents,” the hurricane center said Friday morning. If the storm did hit the U.S., it would be an unprecedented event: Since 1851, 33 named storms have been within 100 miles of Florence’s current position, and none of those storms made U.S. landfall, said Colorado State University meteorologist Phil Klotzbach. “With so much focus on Florence, great attention should be made for potential Helene over the coming days,” said Weather Network meteorologist Erin Wenckstern. She added that a hurricane landfall is possible for the Lesser Antilles, an island chain in the Caribbean. Previous articleCan there be equality in post-apartheid South Africa? US GP final practice & how great is Hamilton?